For years, you’ve been told you need to drink eight glasses of water a day to get the hydration you need. And if you’re trying to lose weight, you’re feeling sick, or you’re training for a big athletic event, eight glasses has always been just the tip of the (melted) ice-berg. It’s strange: In most aspects of our health, we are taught that moderation is the key. But the message when it comes to water has always been more, more, more. In our quest to be healthy, we’ve always thought we could never drink too much water. The conventional wisdom was half right. Proper hydration is the key to unlocking optimal health. But we need to start looking at hydration for what it is: the very essence of your health. You are a body of water. In fact, by the most modest traditional estimates, approximately 65 percent of you is water. If you’re not hydrated, everything else you do to stay healthy (exercising, eating right, stress management, sleep) is undercut. It’s known that humans can survive for about two months without food, but just days without water will kill us. Yet, shockingly, most of us are dehydrated—in fact, some doctors think as many as 75 percent of Americans are dehydrated. Low-grade dehydration is the epidemic behind many epidemics, an omnipresent yet unseen dilemma tipped into new levels of urgency by our modern living conditions. What we eat—including salt-heavy, moisture-lacking processed food—makes our bodies work harder to metabolize. And a lack of hydrating greens and fruits keeps us dried out, even parched, all the time. In addition, we are ever more exposed to fluorescent lighting, dry heat, and air-conditioning…and that’s not even considering all the electronic devices we use that further dehydrate us. The very prescriptions and over-the- counter medications we take to reduce pain, stiffness, allergies, or any chronic condition are also very dehydrating. There is a long list of medications reported to the FDA that actually cause clinical dehydration. You may be using one right now. Think about the last time you took a Benadryl or Sudafed for allergies—surely, you felt these medicines’ dehydrating effects. Are you taking aspirin or acetaminophen for a headache? Xanax or Ambien to help you sleep? Did anyone prescribe taking extra water with that? Add in another surprising source of dehydration: immobility, which slows down or squelches water delivery into cells, as well as the all-important outflow of waste particles. All that sitting most of us do—usually in stale, artificial office air, or while riding in cars for hours—is literally dehydrating us by slowing our body’s flow of water and energy. As a result of all these factors, most of us live in a chronic level of dehydration. The effects of chronic low-grade dehydration are real, long lasting, and potentially very debilitating. We believe this hypo- hydration is the mother of all epidemics and can be linked to many common ailments. The cues are afternoon fatigue, a decline in cognitive performance, headaches, weakness, urinary tract infections, and constipation. But some other disorders resulting from dehydration may come as a surprise: sleeplessness, decreased immunity, joint pain, chronic diseases like fibromyalgia, type 2 diabetes, reflux, and even Alzheimer’s. Suffice it to say that dehydration can have a big— and lasting—effect on our overall health. If we’re hydrating all wrong, what are we supposed to do about it? We know there’s no one way to perfect health. But what if there was something that brought us closer? There’s a better way to hydrate…and the benefits of proper hydration can have a dramatic effect on your health, your vitality, and your overall quality of life.There’s a new way to claim the power of waterand hydrate properly (hint: it doesn’t involve chugging a gallon of water every day). 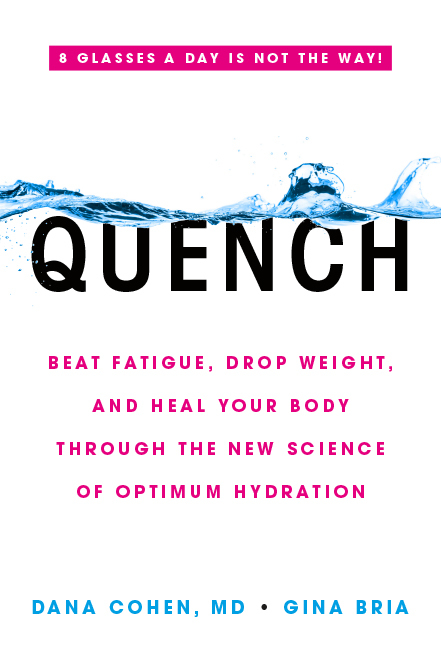 The research presented in Quench shows how to get the water you do drink deep into your muscles, cells, and fascia (the connective tissue of your body where it’s needed most). When it comes to drinking enough water quantity is not necessarily quality. It’s all about absorption, and a proper plan will not push you to simply drink more. Why? Because counting on water alone to hydrate your body is inefficient— and it can even hurt you. Drinking too much water can flush out vital nutrients and electrolytes from your cells and tissues, actually harming your health and limiting your body’s ability to perform. Hydrate deeply and completely—so that all your cells are quenched. You need to incorporate more hydration into your diet not just through water but also through plants, such as fruits and vegetables, seeds, and other hydrating foods. The effects of hydration can be transformative, and once you feel them for yourself, you’ll never look at a simple glass of H2O the same way again. So what are the benefits of proper hydration? For our kids, it can mean better mood and smarts. For athletes who want to perform better, stronger, and faster, proper hydration can be a game changer. For those of us who struggle with health issues like headaches, bloating, and even chronic diseases, getting the right kind of water can alleviate our symptoms and recharge our lives. And for our elders who struggle to get enough nourishment and hydration, this may actually be life-saving information. We can incorporate super hydrating foods into our diet in simple ways. Dr. Dana Cohen MD (right) is an integrative physician in practice for more than 20 years. She serves on the Board of Directors of the American College for the Advancement of Medicine (ACAM), the leading voice of Integrative Medicine, for four years. She is currently an advisor to their Board of Directors and on the education committee and has served as the program director for their yearly conferences, which train more 1,500 master-level health-care providers. She currently serves on the Scientific Advisory Council for the Organic and Natural Health Association. She received her MD from St. George’s University School of Medicine, and completed her three-year internal medicine residency at Albany Medical Center. Biography: Dana G. Cohen, MD has been practicing integrative medicine for the last 20 years. She is currently the Medical Director of Complete Wellness, a 10,000-square foot integrated medical/wellness facility in the heart of Manhattan. She is a nationally renowned internal and integrative medicine specialist whose multi-disciplinary approach has helped treat thousands of patients using a variety of conventional and complementary therapies. In practice for nearly two decades, Cohen trained under the late Dr. Robert Atkins, author of the iconic “Dr. Atkins’ New Diet Revolution,” and Dr. Ronald L. Hoffman, a pioneer of integrative medicine and founder of the Hoffman Center in New York City. Cohen was certified by the American Board of Internal Medicine in 1998, and was appointed to the Board of Directors of the American College for the Advancement of Medicine (ACAM), the leading voice of integrative medicine, where she currently serves as advisor to the Board of Directors and advisor to the education committee. Through ACAM, she also developed an integrative medicine boot camp for practitioners and developed their first webinar based chelation therapy workshop. In addition, she is on the Scientific Advisory Board of the Organic and Natural Health Association. Cohen’s passion for integrative medicine stems from her belief that medicine is an art, and a patient-centered, holistic approach is the vital first step on the path to overall health and wellness. She has helped thousands of patients, on the verge of giving up hope, find relief by restoring their well-being. Cohen’s practice emphasizes the individual, and she has helped countless patients limit their dependence on prescription medications by harnessing the power of diet, nutritional supplementation and lifestyle changes to find wellness. Cohen earned her medical degree from St. George’s University School of Medicine and completed a three-year internal medicine residency at Albany Medical Center and was board-certified by the American Board of Internal Medicine in 1998. She has on-air experience as a radio host and previously co-hosted, “Healthy for Good,” radio show that aired in New York City and “New Vitality Live,” a nationally syndicated show on WOR Radio Network. She has co-authored a forthcoming book, QUENCH: Beat Fatigue, Drop Weight, and Heal Your Body Through the New Science of Optimum Hydration (Hachette Books; June 12, 2018) with cultural anthropologist Gina Bria.